Arrived Sunday afternoon, office is closed on Sunday, and reviewed notice for folks with reservations. Went to assigned site and another rig in our site. Back to office and noted a number to call when office closed. My call was promptly answered and rep came to office to sort out issue. Notice had wrong site number on it, so we went to correctly assigned site. Site (think was the original section of RV park) was narrow with a hedge on hook up/slide-out side. Very little room to put out slide-out and still access storage bins. 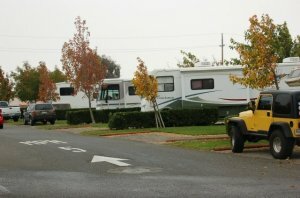 Newer section of RV park doesn’t have hedges and is more open. Once settled all went well for us. Over our week stay met up with the Sunday afternoon staff rep several times and very pleasant with great attitude. One of the larger BX and Commissary’s we have shopped. No wi-fi in RV park (would be a bonus if they installed, lowered amenities because of this), so used the wif-fi in the PAX terminal (open very early in morning until late at night). Two large base gas stations right across the street from each other, prices better than Sam’s or Costco, easy access for RVs. The newer section is actually the ones when you first come into the Famcamp. They are the ones with the hedges. The older sites are the ones after you pass the office. They are often refereed as the "dogs" since they are usually for folks with pets.